Yesterday my sister Pickles and I got the tomatoes and peppers set out. The tomatoes are in 15 gal. 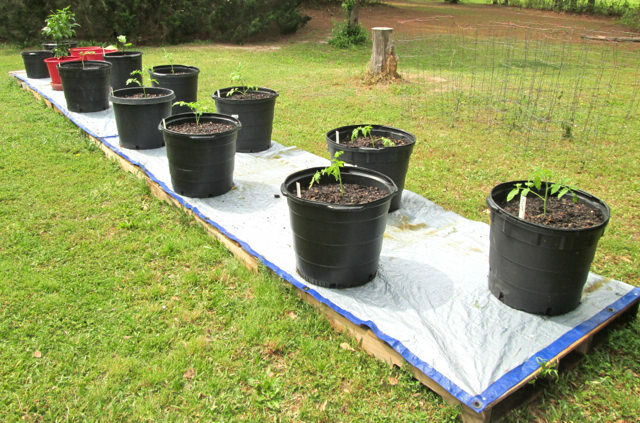 buckets set on pallets and that seems to keep the fire ants out of them, at least it has for the past four years. They've been planted in buckets lately due to the appearance of a bacterial wilt in the garden that affects just the tomatoes. Planted are one each of Better Boy, Celebrity, Creole Original, Early Girl bush, Golden Girl, Homestead, Warrior and Juliet. At the far end are also the overwintered Gypsy pepper and a Millionaire eggplant. We're using a compost/nursery mix bought at an area compost vendor. For $40 we got a whole yard of the stuff which is cheaper than anything I could put together. It's a mix of their products Compostost and Kricket Krap with dolomitic lime and composted fine pine bark and all left to age. The tomatoes loved it last year! Sister Pickles added the cheap tarp this year to keep the weeds from growing up through the pallets. There are three more tomatoes (another Early Girl and Celebrity plus a Black Vernissage cherry (a freebie, new to me) that will be planted later right in the garden to see if that wilt business is still there. Then we planted out the peppers. One each of Feher Ozon paprika, Jupiter (bell), Jalapeno M, Keystone Resistant III (bell), Korean Dark Green (a hot pepper for pepper flakes), Maule's Red Hot cayenne, Blight Buster (bell) and two Gypsy. Those are daikon radishes front right. 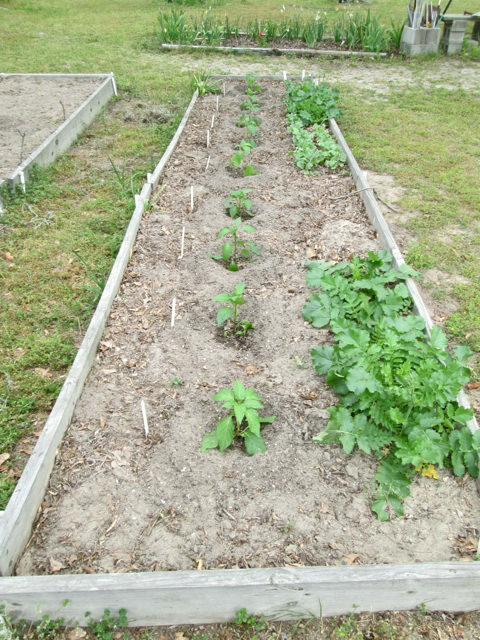 Next week if the soil temp is right, we'll plant out the bush and pole beans, Silver Queen corn, winter squashes, cukes and sunflowers. The planting areas and beds are all prepped and just waiting for seed. That will leave just the sweet potatoes, okra and two watermelons to do when it gets good and warm. Off we go! Just wondered how you keep everything watered?